Under Armour "Accelerate" shorts in high-performance fabric. Super-durable stretch woven fabric for lasting comfort. Lightweight, built-in liner for extra coverage. Moisture wicking and quick drying fabric. Engineered perforation delivers extra ventilation. Side split hem unlocks mobility for ultimate range of motion. Interior pocket in liner short. For in-store inquiries, use sku #2299665. Lafayette 148 New York "Manhattan" shorts in techno-stretch twill. Approx. 11" inseam. Low rise; belt loops. Concealed fly. Side slip pockets. Back besom pockets. Cotton/nylon/spandex. Machine wash. Imported. No Ka Oi "Ikena Uakoko" bike shorts with contrast side stripes. High-rise waistband. Second-skin fit. Knee length. Pull-on style. Nylon/spandex/polyester. Dry clean. Imported. Innovative performance shorts by Peter Millar, offered in a youth fit. Four-pocket style. Internal elastic for room-to-grow fit. Button/zip fly. Polyester. Imported. 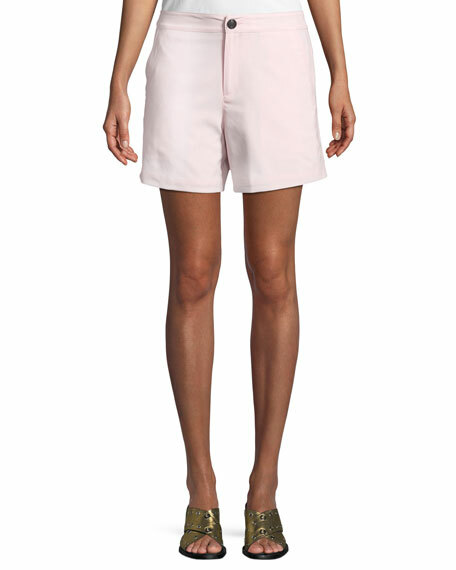 Rag & Bone "Sage" shorts. Approx. measurements: 11" rise; 5" inseam. Trouser-pocket style. Button/zip closure. Flared leg openings. Wool/spandex. Made in Portugal.